I decided to use gold leaf to make the lightning in my drypoint print of King Lear. And now for an exhibition announcement. 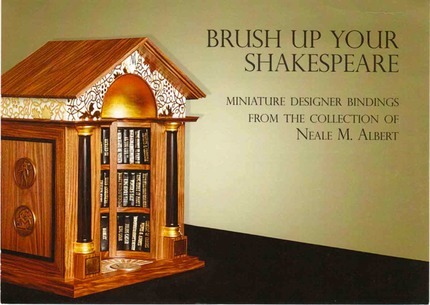 I just received an invitation to the opening reception of "Brush Up Your Shakespeare", an exhibition of Miniature Designer Bindings from the collection of Neale M Albert. 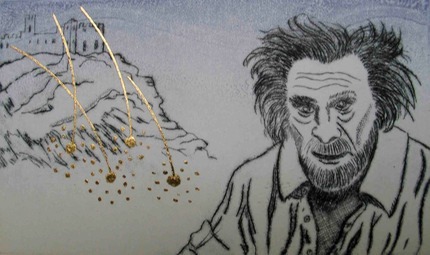 29 June - 27 July at the John Rylands Library in Manchester, England. Some of my Shakespeare books will be in this exhibit. Neale has built this collection over a number of years and there are some exquisite bindings by some of the world's most accomplished binders, and it will be well worth a visit. Unfortunately "Storming Shakespeare" is unlikely to be ready in time for this exhibition, as there is just too much remaining to be done.